The Vienna State Opera House was opened in 1869 with a gala performance of Mozart’s “Don Giovanni”. Since that time, it has been one of world’s leading and most famous opera houses. Great musicians have held the post of director, among them Gustav Mahler, Richard Strauss, Herbert von Karajan, Karl Böhm, Lorin Maazel and many others. The Vienna State Opera (Wiener Staatsoper) is an opera house – and opera company – with a history dating back to the mid-19th century. It is located in the centre of Vienna, Austria. 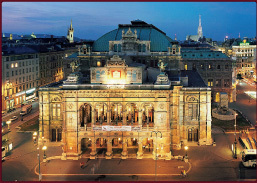 It was originally called the Vienna Court Opera (Wiener Hofoper); in 1920, it was renamed the Vienna State Opera. The members of the Vienna Philharmonic are recruited from its orchestra. The building was the first major building on the Wiener Ringstraße commissioned by the controversial Viennese “city expansion fund”. Work commenced on the building in 1861 and was completed in 1869, following plans drawn up by architects August Sicard von Sicardsburg and Eduard van der Nüll, who lived together in the 6th district. It was built in the Neo-Renaissance style. This was the first opera built in Vienna. The building was, however, not very popular with the public. On the one hand, it did not seem as grand as the Heinrichshof, a private residence which was destroyed in World War II (and replaced in 1955 by the Opernringhof). Moreover because the level of Ringstraße was raised by a metre in front of the opera house after its construction had begun, the latter was likened to "a sunken box" and, in analogy to the military disaster of 1866 (the Battle of Königgrätz), was deprecatingly referred to as “the Königgrätz of architecture”. Van der Nüll committed suicide, and barely ten weeks later Sicardsburg suffered a fatal heart attack so neither architect saw the completion of the building. The opening premiere was “Don Giovanni” by Mozart, on May 25, 1869. Towards the end of World War II, on March 12, 1945, the opera was set alight by an American bombardment, which was intended for the Raffinerie in Floridsdorf. The front section, which had been walled off as a precaution, remained intact including the foyer, with frescoes by Moritz von Schwind, the main stairways, the vestibule and the tea room. The auditorium and stage were, however, destroyed by flames as well as almost the entire décor and props for more than 120 operas with around 150,000 costumes. The State Opera was temporarily housed at the Theater an der Wien and at the Vienna Volksoper. Lengthy discussions took place about whether the opera house should be restored to its original state on its original site, or whether it should be completely demolished and rebuilt, either on the same location or on a different site. Eventually the decision was made to rebuild the opera house as it had been. The Vienna State Opera is one of the busiest opera houses in the world producing 50 to 60 operas per year in approximately 200 performances. It is quite common to find a different opera being produced each day of a week. As such, the State Opera employs over 1,000 people. 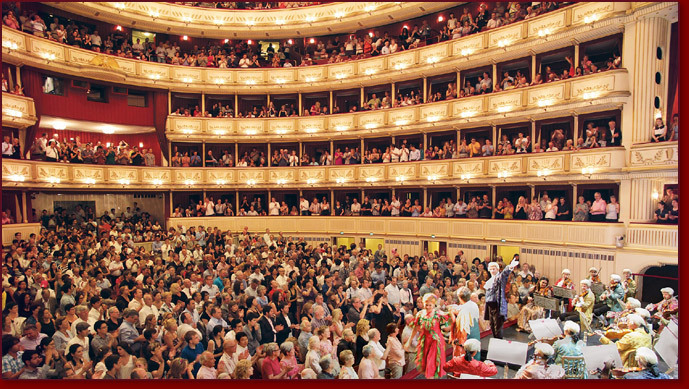 As of 2008, the annual operating budget of the State Opera was 100 million Euros with slightly more than 50 % coming in the form of a state subsidy. The opera company operates a repertoire system: more than 50 productions are staged every year, and there is a performance nearly every day for ten months of the year.